The two most popular cities to visit in the Great Smoky Mountains are Gatlinburg and Pigeon Forge, TN. 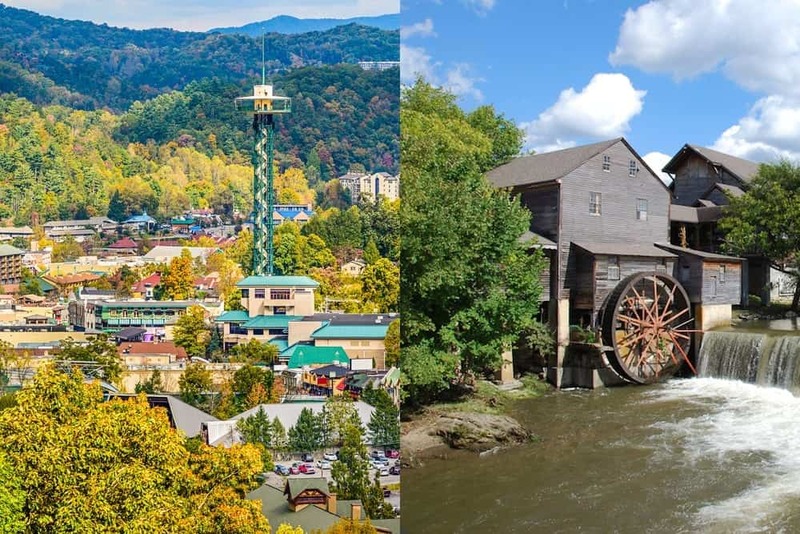 Located next to one another, Gatlinburg and Pigeon Forge share a lot in common, but each city has something special to offer. Aunt Bug’s Cabin Rentals is pleased to provide both Gatlinburg cabins and Pigeon Forge cabins. To help you decide where you would like to stay for your next vacation, we have put together a complete guide to Gatlinburg vs Pigeon Forge. The major difference between Gatlinburg and Pigeon Forge is their layout. In Gatlinburg, the majority of the city’s most popular attractions, restaurants, and shops are all located in the downtown area. Known as The Strip, the heart of the city is comprised of just a few blocks, but it is absolutely loaded with things to see and do. Once you find parking in downtown Gatlinburg, you can walk to all of the destinations on The Strip. If you enjoy exploring a city on foot, you’ll love Gatlinburg. In contrast, the best way to get around Pigeon Forge is by car. The most popular section of the city is the Parkway, the main road that is lined with dinner theaters, go kart tracks, shopping complexes, restaurants, and more attractions. While you typically need to pay for parking in Gatlinburg, virtually all of the destinations on the Pigeon Forge Parkway have free parking lots. If you like driving from one activity to the next, you will love cruising down the Parkway. It is worth mentioning that both Gatlinburg and Pigeon Forge have great trolley systems, which make getting around each city very convenient. For just 50 cents per ride, you can travel around the Gatlinburg Strip or the Pigeon Forge Parkway. Another thing to consider when comparing Gatlinburg vs Pigeon Forge is each city’s major attraction. For Gatlinburg, the city’s biggest draw is arguably its proximity to the Great Smoky Mountains National Park. Over 11 million people visit the Smokies each year, making it the most popular national park in the United States. Vacationers will find endless outdoor activities in the park, including 800 miles of hiking trails, scenic auto tours, wonderful picnic areas, horseback riding, wildlife viewing, and so much more. Gatlinburg is located right at the entrance to the national park. Pigeon Forge’s most famous attraction is Dollywood, the awesome theme park owned by Smoky Mountain native Dolly Parton. As the largest ticketed attraction in Tennessee, Dollywood truly has something for everyone. Guests will find thrill rides, music shows, craft demonstrations, mouthwatering food, a museum dedicated to Dolly Parton’s life and career, the Southern Gospel Museum and Hall of Fame, and even more fun things to see and do. During the summer months, vacationers can also enjoy Dollywood’s Splash Country, an incredible water park located next door to Dollywood. Of course, Pigeon Forge is just a short drive from the Great Smoky Mountains National Park and Gatlinburg is just a short drive from Dollywood. However, if you plan on making return trips to either the national park or the theme park, it might be convenient to stay near your preferred attraction. In addition to the national park and Dollywood, Gatlinburg and Pigeon Forge have hundreds upon hundreds of other fantastic destinations that you don’t want to miss. We have put together a list of some of the top places to visit in each city. Regardless of where you land on the Gatlinburg vs Pigeon Forge debate, you are sure to have an unforgettable vacation in the Smokies. As noted above, the two cities are adjacent to one another, so you can easily enjoy all of the fun Sevier County has to offer during your vacation. Located in the foothills of the mountains, our cabins are the perfect place to stay for your getaway. With everything from 1 bedroom cabins for romantic retreats to 8 bedroom cabins for family reunions, we are guaranteed to have the ideal accommodations for your escape. To start planning your vacation, browse our selection of Gatlinburg cabins and Pigeon Forge cabins.